When product or process names are reduced to acronyms, the name conveys no purpose. This contributes to the perception (and cause!) of process for process sake. For example, the “PBC process” devolves to filling in HR forms and hoping for a raise while the “Personal Business Commitments process” conveys more meaning — what are the commitments, were they delivered and what impact did they have on the business. Camouflage strategic initiatives as corporate jargon and it’s not surprising 80% of employees say they don’t know what the goals of the organization are! 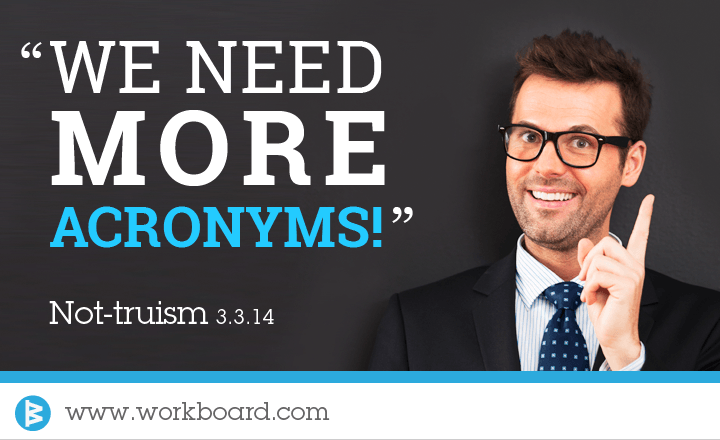 Good chance your organization doesn’t have an acronym dictionary (or you have to know its acronym to find it). Using code speak to coordinate execution and communicate internally means you’re relying on each individual to raise their hand when they don’t know the code. That’s as effective as speaking Portuguese at meetings in Chicago – some people will get it but the rest will tune out. In challenging environments or where M&A is common, acronyms simply exclude people who can and should contribute value to business outcomes. Customers shouldn’t have to decode your conversation. More importantly, using product names with customers can accelerate their understanding. A Global Retention Schedule Management System says what the product is while GRSMS says nothing and is remarkably hard to say! If your organization sells more than one product, avoid acronyms so customers better understand the breadth of purposes and problems to which your product set applies. And remember your group and division acronyms don’t help your customer understand where services, products or staff come from – they give the client another task to do to get value from your organization. Short cuts are great when they help you get to the intended destination faster; check your acronym habits to see whether they’re short cuts or just bad habits that slow business down. To break a bad acronym habit, try saying “LMNOP” every time someone uses an acronym. It’s a humorous way to point out how nonsensical acronyms sound to those not in the know and how empty they can be even if you do know the code. P.S. If you’re trying to help your team better understand objectives, communicate work progress more efficiently and get to goal faster, check out WorkBoard! It increases team velocity with goal transparency, shared work plans, and status reports that take less effort and provide more insight.